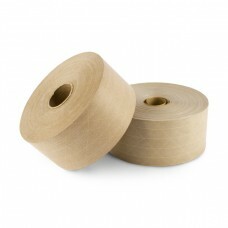 Paper gummed tape also known as water activated tape or simply, gummed tape is starch- or sometimes glue-based adhesive on a Kraft paper backing which becomes sticky when moistened. Reinforced paper gummed tape is used for closing and sealing boxes. Before closing corrugated fiberboard boxes, the tape is wetted or remoistened, activated by water. Looking for Reinforced Paper Gummed Tape Dispenser? Water-activated tape, also known as gummed tape dispensers, generates an immediate, strong bond resulting in a superior seal on corrugated cartons. A gummed tape dispenser provides a fast, simple and convenient way to size, wet and cut water-activated tape for closing corrugate cartons. Better Packages offers the widest range of paper tape dispensers and carton sealing solutions available from a single manufacturer. With its durable Better Pack® brand of water-activated paper tape dispensers and Better Pack Tape™, Better Packages can help you to increase productivity, package security and strength with an environmentally friendly carton seal.